If we measured unemployment the way they did during the 1930s, today's unemployment would be worse than any single year of the Great Depression. TL:DR - The graph isn't comparing the same measurements of unemployment, disregards the preference of one of its sources, and as far as I can tell peak unemployment during the Great Depression was roughly double what it was during the "Great Recession". Note: "Marginally attached workers" are added to the total labour force for unemployment rate calculation for U4, U5, and U6. The BLS revised the CPS in 1994 and among the changes the measure representing the official unemployment rate was renamed U3 instead of U5. As Wikipedia states, the U3 measure is the "Official" measure, but U6 is oft-cited as the "true" unemployment rate by critics. As you can tell from the graph, the U3 rates for the Great Depression mimic the information in the graphic: Roughly 23%. However, the U3 rates for 2010 is less than half of the Great Depression's peak: Roughly 10%. Wikipedia also has a graph comparing the various UX rates since the 1950's. The U6 rates estimated by the graph for 2010 appears to be about 17-18%, which is closer but still not the numbers presented in the graphic. More to the point, if the Great Depression unemployment rate used by the graph is the estimated U3 rate (which seems likely), then comparing the U3 to the U6 is disingenuous. 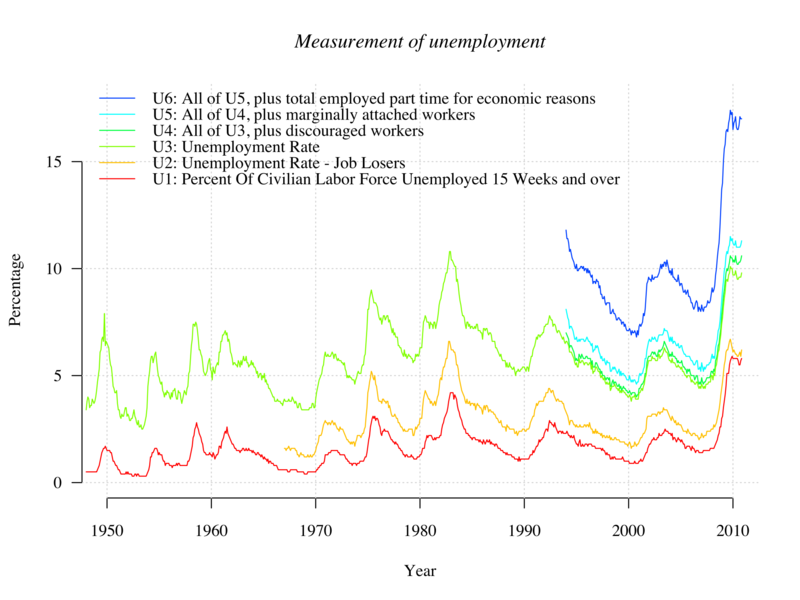 Based on that research, [N. Andrews] was able to generate a mathematical formula to calculate U3 and U6 unemployment for the entire period since 1900. He found that at the peak of the Great Depression, U3 was 25.2%. U6 was 37.6%. There was some academic work, where people have looked back and said, well if you constructed U6 the same way that it's constructed today, you'd be at something like 37%-38% unemployment rates on the U6 basis during the Great Depression. So, we are nowhere near that. Right now the number is about 16.6%. 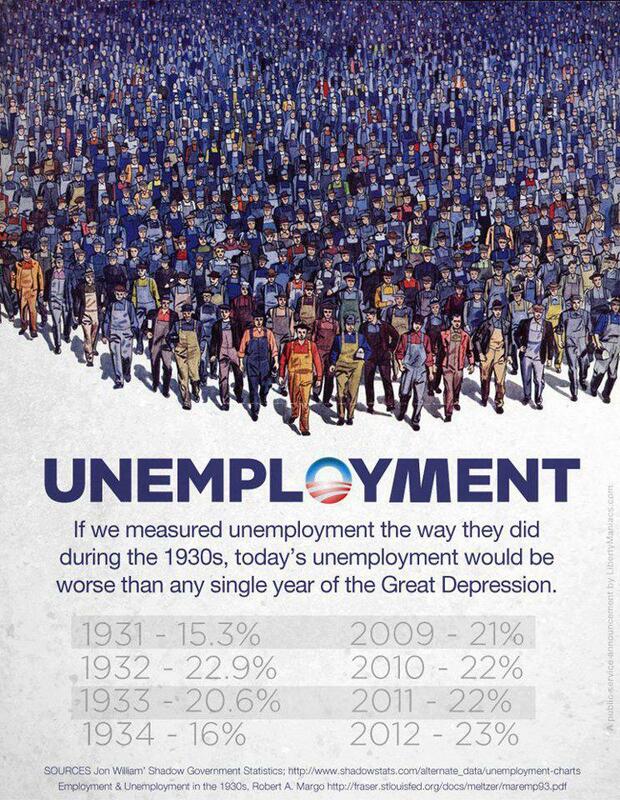 The U6 unemployment rate counts only 2.5 million of those 8.2 million who have given up hope and dropped out during the Obama years. The ShadowStats website, which counts the long term discouraged workers the government doesn’t count, reports the total rate for the unemployed and underemployed (part time for economic reasons) as 22.8%. The other column in your graph, specifically referring to the Employment and Unemployment in the 1930's paper by Robert A. Margo from 1993, is taken from the third page of the PDF document. The difference between Lebergott's and Darby's series reflects the treatment of persons with so-called "work relief" jobs. For Lebergott, persons on work relief are unemployed, while Darby counts them as employed. "Work Relief" in this context were the government-funded jobs programs for public works. In counting persons on work relief as unemployed, Lebergott (1964) was effectively following census practice in 1940... Consistency with the search approach to unemployment would, at the very least, require that such persons be separated out from the unemployed who were actively searching for work, which Darby fails to do. I am grateful to Stanley Lebergott for these points. Lebergott's numbers are calculated the same way that the BLS calculated U3 numbers in the 1940's. Darby's numbers come from counting everybody building roads as "Employed", which is why the numbers differ drastically in an era where great public work projects was the target of significant government spending. The graphic presented in the question is comparing what is essentially John Williams' (U6 + "Other Factors") Unemployment rate to Darby's Unemployment rate, which is significantly less than the U3 Rate for the same era. The creator of the graphic is cherry-picking the highest numbers they could find for 2008-2012, and the lowest numbers (lower than what the BLS would calculate) they could find for the Great depression. Ultimately, NO - the two cannot be compared. They are not only calculated in a wildly different fashion, but there's a significant amount of dishonesty by omitting Robert A. Margo's preference for Lebergott's numbers over Darby's because Lebergott's were calculated using practically the same method that the BLS uses. As far as I am able to tell, unemployment rates in the Great Depression peaked at double the highest rate from 2008-2012 when you compare the same measurements. Not the answer you're looking for? 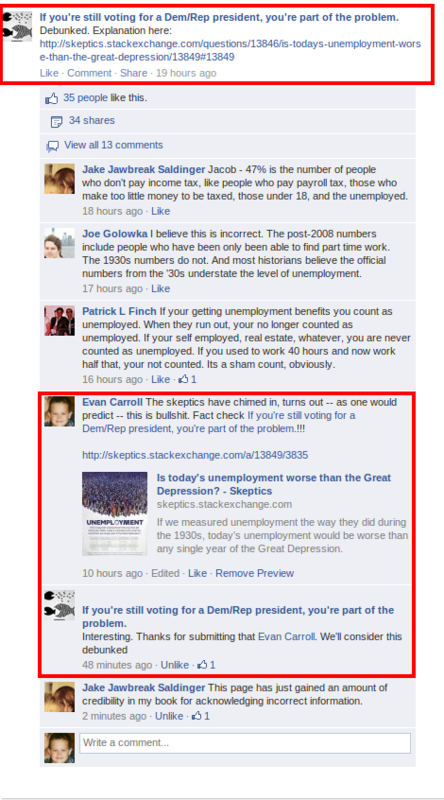 Browse other questions tagged unemployment .